Peninsula Square. 1 December 2018 - 6 January 2019. Greenwich Peninsula. This year we’ve re-invented the Christmas tree and have brought you the ‘Rainbow Halo’ at Greenwich Peninsula. 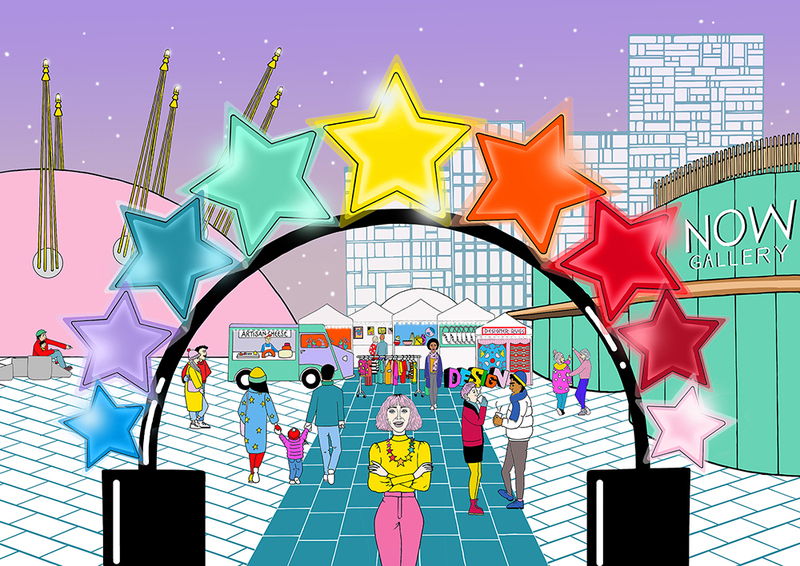 Designed by the duo behind jewellery brand Tatty Devine, Peninsula Square is hosting an alternative, festive archway throughout December until 6th January. Inspired by Tatty Devine’s vibrant Chase The Rainbow collection, the Rainbow Halo draws on a joyful technicolour aesthetic; supersizing statement jewellery to create an art installation. Tatty Devine’s Rainbow Halo features a rainbow archway sprinkled with jewelled stars, each one representing themes celebrated at this time of year; love, peace, unity, luck, magic and joy. In line with the Peninsula’s fusion of art, culture and architecture, the Rainbow Halo stands centre stage for the festive season. Place yourself in front of this seasonal sculpture for a festive selfie and to crown yourself with your very own Rainbow Halo. Lighting up Peninsula Square from 1 December 2018, Tatty Devine’s Rainbow Halo is magical, colourful and bold.